When Apollo 11 slowly lifted skyward from Cape Kennedy on its lunar flight, spewing violent clouds of smoke and flame in its wake, more cameras than pairs of eyes seemed to be aimed at the launch pad. The prospect of being able to record history while-it-was-being-made was too great a temptation to the thousands of newsmen and newswomen at Press Site 39. Every reporter who owned or could borrow a camera seemingly put aside his or her typewriter and notebook and turned photographer to record the spectacular event on film. There were so many people taking pictures at blast-off at the site, the pros were in the minority. The only way you could distinguish between the pro and amateur was the pro's more abundant equipment and a pink press-badge. The working photographer inevitably was shooting with two or more cameras, in most cases with motorized Nikons, and with very long lenses. A spot survey indicated that about 71 % of the photographers used Nikons. Life magazine's Bill Eppridge, for example, covered his part of the launch with 6 Nikons with Motor Drives, 2 Nikons without a motor and 4 Nikkormat cameras. Many of the pros had special setups to insure good photo-reportage of the event. Some of these set-ups were fascinating. 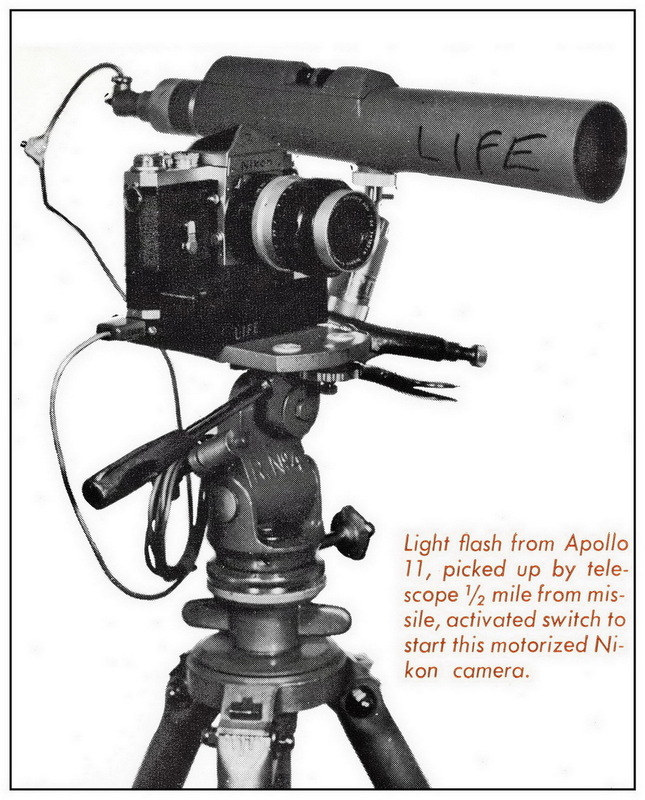 Several of the media - National Geographic, Life, Washington Post, Houston Chronicle, to name four - placed light-actuated, motorized Nikons, on the launch pad or close to it. 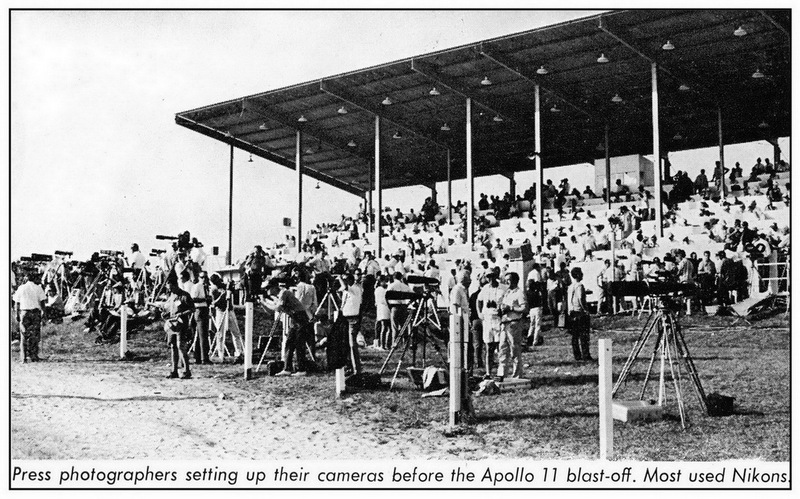 These cameras automatically began operating at the moment the Saturn V rocket fired. Credit National Geographic photographers for the ingenuity to devise the light-actuated setup. All that is needed for such a device, in addition to a Nikon with a Motor Drive, is a telescope or spotting scope, a slave unit connected to the scope and a wire connection between the slave and battery pack of the Motor Drive............about $20 worth of material, all easy to get. 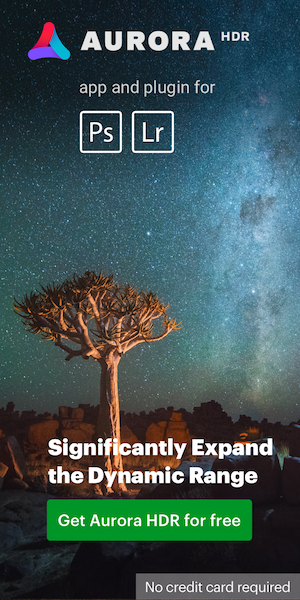 National Geographic's final setup was somewhat more complicated and sophisticated. John E. Fletcher used a variable telescope (15 to 60x) and a light-actuated silicon-controlled rectifier (LASCR). The sensitivity of the LASCR was controlled by a variable potentiometer (set by a screw in the center of the back of the camera assembly). The LASCR was mounted in a microphone connector which was attached to a black collar, a specially machined unit securely attached to the telescope to assure proper optical alignment. An electric cord wired into the LASCR at one end and to a male plug at the other completed the assembly. When the rocket's engines ignited, the light was concentrated by the scope optics onto the LASCR which acted as a switch or electrical gate to start the motorized Nikon. 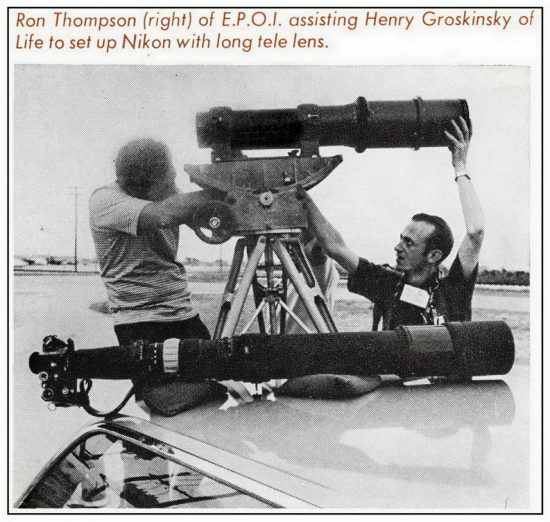 National Geographic used 10 motorized Nikons at and around the launch site (305 meters away or less) and at the Press Site, with lenses from 28mm to 200mm. Special tripod bases were used to prevent vibration from the rocket blast sound waves hitting the cameras. The Nikons at the Press Site, for example, were mounted on a steel post with a steel plate on top for the cameras and another steel plate buried in the ground. Sandbags were piled on top of the latter and against the post to make certain it didn't move. 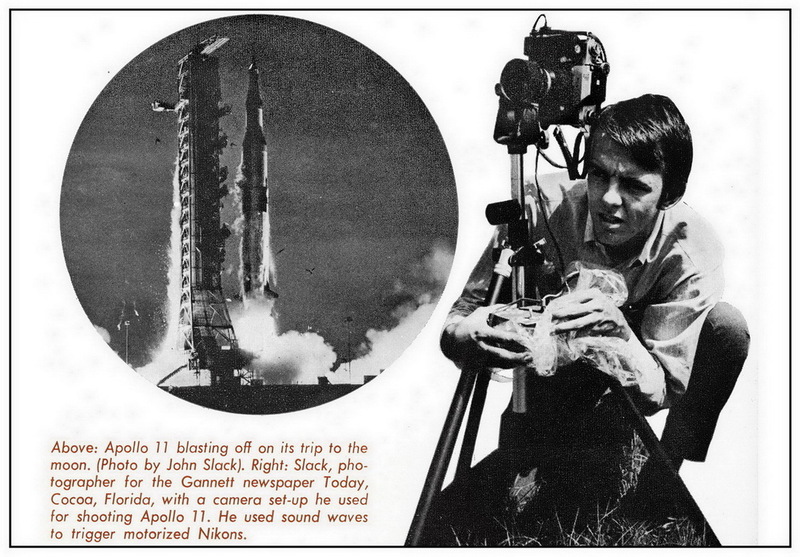 Sound waves also were used to trigger motorized Nikons at the Apollo 11 launch. John Slack, 20-year old photographer for the Gannett newspaper Today, Cocoa, Fla., pioneered the technique at the Apollo 9 launch. He used a homemade amplifier produced from $15 worth of electronic parts by Les Frost, an engineer at WEZY Radio, and Jim Rife and Hoyt Ingle, both of Today's mechanical department. For Apollo 11, Slack used 4 motorized Nikons and a more advanced stereo amplification unit with a sensitivity control, a small crystal microphone. All the cameras were less than 366 meters away from the launch pad. One was set up with a 105mm Auto-Nikkor on the east side of the pad. A second was on the west side, at the base of the escape slide wire, hooked to a fence. Two were on the southeast side, one with a 5Omm Auto-Nikkor and the other with a 85mm Auto-Nikkor. One captured a spectacular scene, in colour, of the rocket firing with seagulls in the foreground which was used, full page, in the July 28 issue of Newsweek as well as many other publications. Life magazine's special equipment was both plentiful and frequently intricate. Ralph Morse, shooting both for the NASA photographic pool and for Life set up 12 motorized Nikons in and around the launch pad. Three Nikons with 2S0-exposure Motor Drives in nitrogen-purged boxes (filled with nitrogen to prevent sparks from the batteries causing an explosion) were placed near the rocket. One camera was bolted to the gantry at the 110-meters level, 12 meters away from the rocket. It was inserted in a firebox to protect it as the rocket passed by and was hooked into the missile sequencer. The camera got a series of dramatic shots of the rocket lifting up and passing by. A second 2S0-exposure motorized Nikon was bolted to the gantry at the 98-meters level. A clock was built into the box holding the camera so that when the 'suit man' for the launch threw a magnet - the camera operated for 2 minutes (120 exposures at the rate of one per second), cut off for 8 minutes, and then turned on again to shoot until the balance of the 250-exposure film load was exposed. The third 2S0-exposure motorized Nikon was bolted to the shaft of the elevator facing the path along which the astronauts had to pass. A blockhouse worker had the job of throwing a switch that set the camera in operation when he saw the astronauts walk toward the elevator on his television monitor. Morse himself shot the lift-off from a helicopter 11km away. Toshio Kato, a staff photographer of Kyodo News Service in Tokyo, and his assistant, Koichi Kugimiya, had two motorized Nikons wired to a pistol grip so they could be operated in tandem. Each camera was equipped with a 600mm Auto-Nikkor and was mounted on a special base so that both cameras could track Apollo 11 in flight. Several photographers were using foot switches wired to their motorized Nikons so they could keep both hands free to track the rocket when it lifted up into the sky. 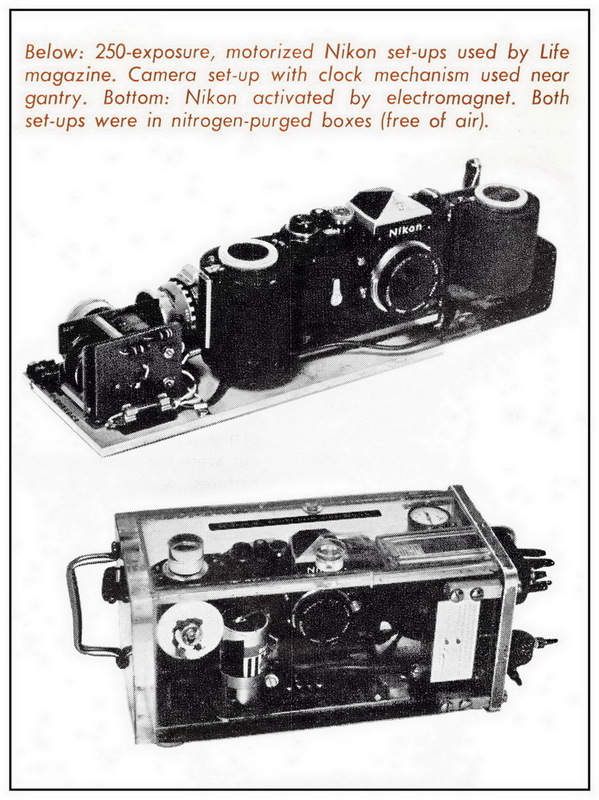 One of the unusual rigs worked out by Ron Thompson, Nikon technical representative, for Charles Scherer of Washington, D.C., was a wire device that started 6 motorized Nikons operating with a single pull of the wire. At 9:32 A.M. July 16, Apollo 11 slowly lifted from its pad, the many Nikons and Nikkormats were shooting constantly and in 10 seconds or so it was all over. Historical research, images & text compiled by Ron Volmershausen. Sources/Credit - Nikon, NASA, LIFE Magazine, Newsweek Magazine, George Berkowitz. This entry was posted in Other Nikon stuff and tagged Nikon & NASA, Ron Volmershausen, [NR] Guest Posts. Bookmark the permalink. Trackbacks are closed, but you can post a comment.